Holiday Inn Gatwick Airport is just five minutes from the Airport. Conveniently located just 10 minutes from the airport. London Gatwick Airport's North and South Terminals are within 10 minutes from Holiday Inn London-Gatwick Airport on our 24 hours shuttle bus. All rooms have en-suite bathroom, tea and coffee tray, interactive TV, high speed internet access, radio, trouser press and hair dryer. Day rooms available. Family rooms for 4 will consist of a double bed and a double sofa bed. 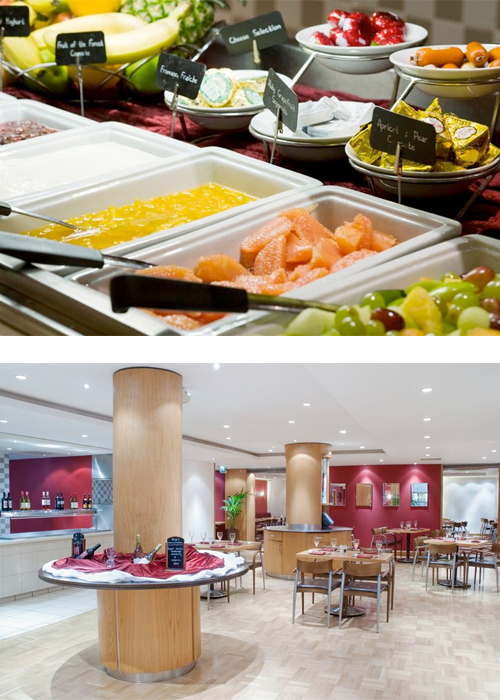 The Restaurant offers a Carvery and an A la Carte Menu. Set Menu is £20 for 3 courses. (Menus can change depending on the volume of business, please check the offer proposed on the day). Light meals and snacks are available in the Hub Bar and Lounge area. The Shuttle Bus runs 24 hours per day every 15 minutes and every half hour from midnight to 5am to both terminals. Full English breakfast is £15.95 per person, FHR clients can purchase voucher at reception to get special £11.95 per person rate. Between 6am and 10am.